What is the difference between the different XE700T1C models, besides their price? The Samsung website and online support was no help. In December 2012 I replaced my Motion LE1600 tablet with the Samsung XE700T1C ATIV smart PC. Samsung offered four versions of this model but failed to explain the differences between them. The Samsung website and marketing materials only provided cut-and-paste generic specifications for these four models. Even Samsung's technical support group offered conflicting and erroneous information during my online chat with them. Keyboard Dock "Available with Keyboard Dock Accessory" "Available with Keyboard Dock Accessory" "Available with Keyboard Dock Accessory sold separately"
The "Available..." and "Available...sold separately" terms come from the Samsung product specification website for these tablets. Apparently, Samsung uses the phrase "Available..." to mean "Included" for the first three models and "Not Included" for the fourth model. Silly me for misunderstanding. The Windows 8 version, keyboard dock, TPM security, and the Intel 6235 WiFi chip appear to be the major differences between the XE700T1C-A01US and XE700T1C-A04US models. These two models differ by $270 in street price. The detachable keyboard retails for about $130, making the XE700T1C-A04US model $400 more expensive than the XE700T1C-A01US. 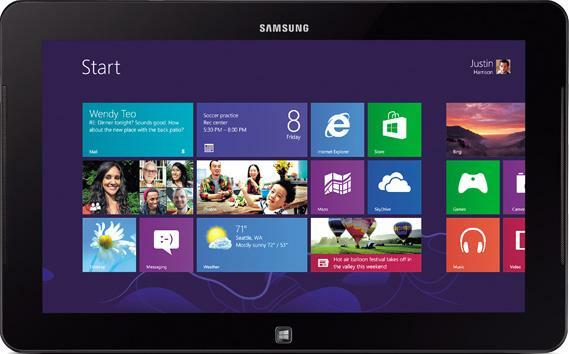 Samsung introduced model XE700T1C-K01US, a consumer-grade Tablet PCs with a more powerful CPU. It lacks TPM security. Click here to read my review. The A04US model with a cellular wireless options is now available as Ativ Series 7 model HA1US. This newer model is available from AT&T wireless. Click here to read the review. Out of frustration, I have started listing Samsung marketing confusions and technical issues about this Tablet PC. As far as I can tell the A04US has the following differences you did not catch, all within the Wifi area… Not worth the 400+ Price Point. You are right. It is disappointing that a consumer electronics company would expect its customers to hunt for basic information. Which of these have 3G/cellular option? None of these models include 3G cellular links. They only have wifi. I just saw the cellular model. It is Samsung ATIV model XE700T1C-HA1US. It appears identical to the A04 model plus AT&T wireless networking. Really effective and brief clarification! Everything was laid out perfectly! You were the first and top link to my curiosity !